Legal news for Maryland firefighter attorneys – The family of a cadet who died in a practice drill in 2007 has filed suit against the city, claiming extraordinary negligence. Drill consisted of seven fires, not the federally mandated one. Firefighter cadet died. Baltimore, MD (www.NewYorkInjuryNews.com) – The family of a Baltimore fire cadet killed in a 2007 fire training exercise filed a lawsuit against the city, seeking $35 million in damages, as reported by www.wbaltv.com. In February 2007, the fire department was conducting training exercises at a west Baltimore rowhouse. Wilson and other trainees were sent into a rowhouse that officials had set seven fires within. National safety rules mandate that only one fire be set when performing these drills. Investigations performed by internal and independent sources found the Baltimore City Fire Department’s exercise had tremendous flaws. The investigations spurred the allegations that not only were the cadets not properly prepared for the drill, but there was also no evacuation plan if the cadets were to become overwhelmed. According to United Press International, several of Wilson’s team members evacuated the rowhouse when they realized their lives were in danger and tried to pull her to safety. Wilson was flown to a trauma center, where she was pronounced dead. The lawsuit claims Wilson’s breathing apparatus and protective gear were inadequate. Furthermore, radio communication was poor. The suit states Wilson’s federal civil rights were violated and she was denied life and liberty. 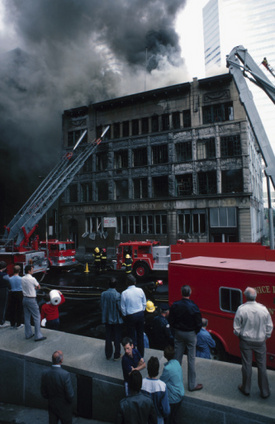 The suit names Wilson’s supervisors, alleging that former Division Chief Kenneth Hyde and former Lt. Joseph Crest were aware of the numerous hazards the training exercise posed, but took no measures to prevent them. The suit also names a third supervisor, Barry Broyles as a defendant. While all three were dismissed after Wilson’s death, Broyles was later reinstated. Baltimore city solicitor George Nilson deemed Wilson’s death a “terrible accident” and told reporters the city has done its best for the family. Legal News Reporter: Tara Monks – Legal news for Maryland firefighter lawyers.